There are several types of Balsaun in the Parsi cooking repertoire. Balchao or Balsaun ,it can be red or green depending on the chillies used in preparing it. 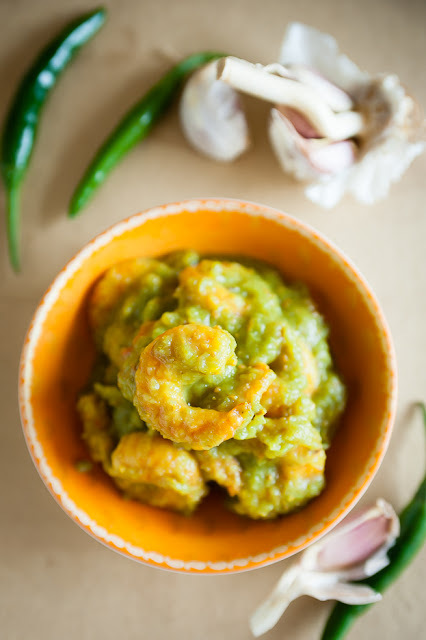 A typical jhinga nu achar (prawn pickle) is made with red dry chillies, similar to the Tarapori Patyo. This Leeloo Balsaun is made of green chillies (as the name suggests) and lemon pickle. A wonderful condiment an old family recipe that has been enjoyed by many generations. In a pan heat the oil and add the onions, saute until pale brown. Grind together the green chillies, cumin, garlic, lemon and lemon juice into a paste. Add this paste to the cooked onions and mix well. Cook on a gentle flame until the oils are released on the sides in little beads of sweat. Continue mixing it gently from time to time. This will take about 15 minutes. Now add the turmeric, salt and jaggery. Mix well until everything is incorporated. Another 15 minutes on low heat. Lastly add the prawns. Stir and cook until tender. About 7 minutes. Fill the sterilised jars and leave it to cool completely before sealing the tops of the jars. Refrigerate up to 3 months. Chop the prawns into smaller pieces. Condiments are easier to serve in smaller quantities. Always use a clean dry spoon. This keeps the pickle from spoiling. While any cooking oil works well, I prefer to use grape seed oil for this recipe. The spice level of this is medium hot, add green chillies to raise the level of spice . It is easy to measure the spice level of a chillie by smelling it once cut. While September and October produce the hottest chillies, removing the central membrane of chillies keeps the flavour and reduces the spice. 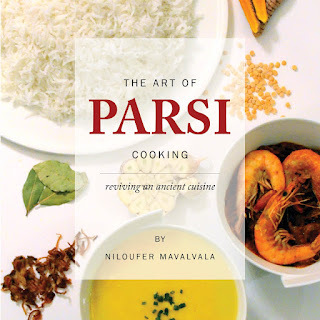 For more Parsi Food recipes click on The Art of Parsi Cooking;reviving an ancient cuisine.